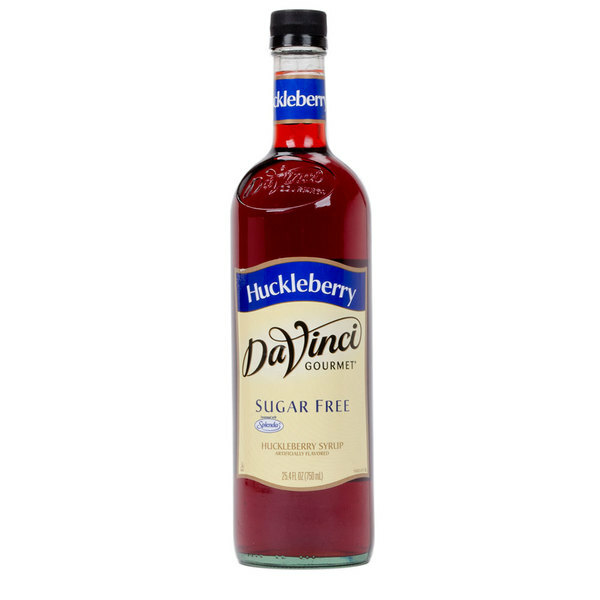 This user-friendly bottle of DaVinci Gourmet sugar free huckleberry flavoring syrup allows your busy baristas to quickly and easily serve up delicious hot, cold, or blended drinks with irresistible flavor without the sugar content! DaVinci Gourmet flavoring syrups complement your beverages without overpowering them or being too sweet. They are specially formulated to resist curdling in milk and hold up well under heat, making them the perfect choice for espresso-based drinks, brewed coffee or tea, and more. 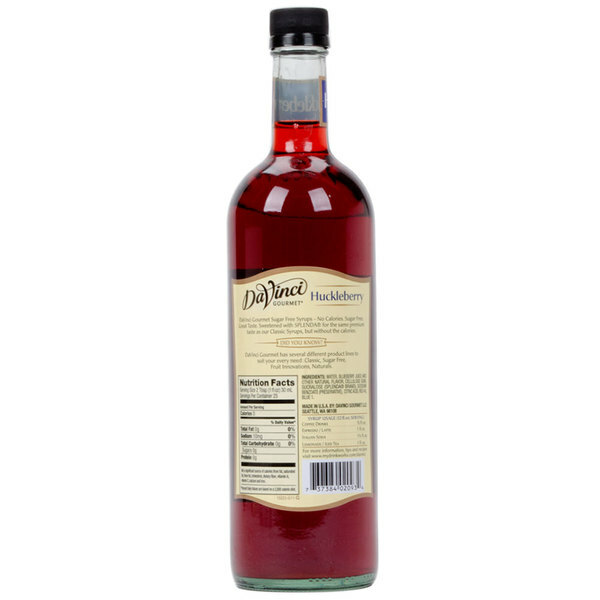 Bring a new flavor to your desserts or mixed drinks with this DaVinci Gourmet huckleberry syrup. Similar in taste to blueberries, huckleberry flavor is sweet and tart. Add this syrup to your berry flavored drinks or drizzle it on cheesecakes and other sweet treats! Sweetened with sugar free, no-calorie Splenda Brand Sweetener, this sugar free blend is sure to be a treat for your health-conscious patrons! Splenda tastes like sugar, giving you great flavor without the calories. Sold in gourmet coffee shops, specialty food stores, food service outlets, and grocery stores, DaVinci Gourmet products, like this sugar free huckleberry flavoring syrup, have a long history of commitment to quality and superior taste. I really recommend using huckleberry flavor over blueberry flavor. Huckleberry brings a nice tartness the blueberry flavoring doesn't have. It will make for a much better cocktail. The Huckleberry sugar free coffee fruit syrup was a great pick up for our syrup collection. The huckleberry flavor is authentic and great for adding to tea. I love huckleberry and was so glad to find a sugar free version. The syrup has a blueberry smell and taste but not quite as strong. Great for flavoring teas and lemonades. This one tastes and smells like blueberry. Many liked this flavor in iced teas. I wish the brand would have used a sweetener other than splenda. I must say I had never tried Huckleberry before this syrup and I was not missing out on anything. This is probably a great syrup just not my thing. This syrup is awesome! It adds a very special flavor to smoothies and other summer drinks. Try adding it to iced tea or sparkling water for a refreshing twist. This syrup has a good flavor but is very thin. It can be used for drinks, no problem. I tried putting in on my pancakes but it seems like I will need a thickener to get it the right consistency.